Jonathan R. Bass became a celebrity by doing nothing at all. One of the most famous and perplexing medical cases at the turn of the century centered on this local man whose mysterious affliction made him a popular show business attraction. 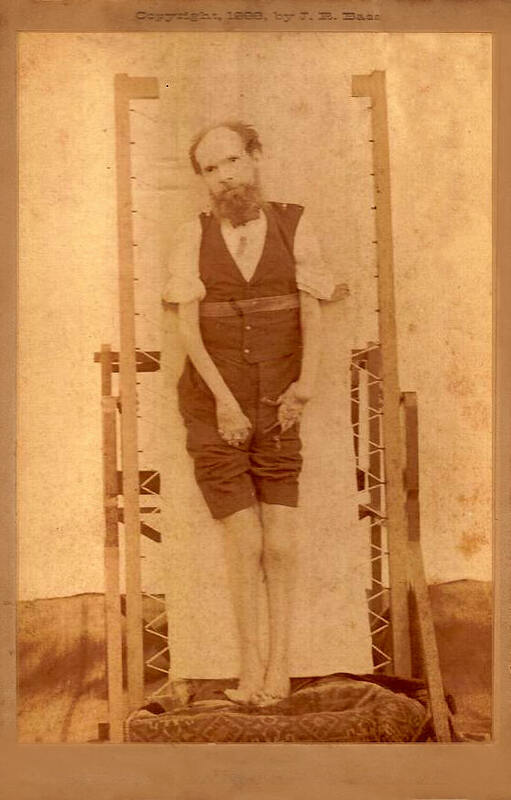 Internationally known as the "Ossified Man", "Bone Man," or "Stone Man," Jonathan Bass suffered from a gradual ossification (an ankylosis or freezing of the joints) that left him completely paralyzed and blind at age 37. Bass's case baffled the top physicians and scientists of the Victorian age just as it does today. There are approximately 200 current cases of partial ossification in America; while doctors are now-able to explain the cause, there still is no cure. Lockport resident Nancy Snell was the wife of the late John K. Snell, the great, great nephew of the ossified man. She said the Bass family hailed from a long line of pioneers from Massachusetts, and claimed relation to John Adams, as well as to Colonel Jonathan Bass, a hero of the French and Indian and Revolutionary Wars. Snell said that "no one in the family had, or would, become the victim of young Jonathan's mysterious affliction." Rather, the Bass and Snell families bore a number of professional and semi-pro athletes. Born in Cambria on September 25, 1830, Jonathan Bass was the son of local clothier and farmer William Bass and homemaker Fannie Richardson Bass. Named after his colonel grandfather, young Jonathan Bass had an exciting childhood, growing up in the wild, wooded lands of Western New York. He was noted for his farm horse strength, distinctive handsomeness, studious habits, and occasional mischief. Snell has a copy of an autobiographical booklet, published in 1889 after Bass became famous, that illustrated his unusual physical strength by relating the tale of the 15-year-old's fracas with his rather conservative schoolhouse teacher. Bass skipped school one sunny autumn day, showed up late the following day, and found himself the subject of the school master's wrath. When the other students had left that afternoon, the teacher first delivered a stern lecture and then "administered corporal punishment," brutally whipping him with a ruler. Surprising the teacher, Bass seized the ruler after a number of blows and grabbed the teacher, forcibly holding him "long enough to impress upon him the realization that the boy could master him." The man kicked Bass out, locking the school house door, but Bass wasn't through with the school master yet. The young man "burst the door open" and the two fought until Bass "carried off the honors." Other than suffering bouts of rheumatism when he was seven and nine years old, Bass was a healthy child who grew into a strapping teen. His father, William, died when Bass was just 14 years old, leaving Bass to attend school and labor on the family farm to support his mother and three brothers, Foster, Seth, and W.B. The youngest child was just four days old when the father passed away. When he was 16, Bass lived briefly with family friend G.W. Rogers in Lockport and took the tough summer job of moving timber from Lockport to Troy, New York, along the Erie Canal. The autobiographical booklet says, "There was no one on the canal who could handle a rudder and tow line better than he," but the long hours in the water may have been a trigger to the physical malady that lay in wait. Bass continued to work summer jobs and attend school in the winter, when, at 17, he felt the first subtle pains of what he had no idea was the pending ossification. Not since that second bout of rheumatism, which kept him homebound for six weeks, had Bass experienced such an affliction. It started in 1848 with a morning stiffness of the joints that Jonathan Bass easily shook off and then finally hit on July 22 when he was strolling down High Street in Lockport and "suddenly the ball of his right foot felt as though some sharp instrument was penetrating it to the bone." He took off his boot, yet failed to find the peg or nail that could have caused the pain. He limped home and the pain turned to a burning sensation. He couldn't even stand up the next day and the pain spread to his knees. He was treated again for rheumatism. He was seen by a number of physicians, but, what became defined as Bass's unknown "malady" continued until fall 1848 when he could finally only walk with a cane or crutches. He saw hundreds of doctors between 1848 and 1853 and sought various treatments at Avon Springs, Oneida, and Waterville, New York. Struggling with his spreading paralysis, Bass attended college in Waterville, and held various jobs around Buffalo including managing a canal barn for horses, clerical work for a canal contractor, laying sidewalk, and accounting. Bass was also a voracious reader whose level of intelligence seemed to increase, according to the booklet: "...what his body lost in strength, his mind had gained." He was also described in a newspaper as a "staunch Democrat." He continued to see many doctors. In addition to prescribed medicines, Bass received "galvanic treatments," but nothing slowed the ossification. The International Journal of Surgery featured Bass, explaining his condition, and proclaimed, "He boasts the best of health, and, though on his back all the time, eats and sleeps well." Dr. J.M. Reed of New York City examined Bass and called him "a living wonder," while Dr. D.F. Smith of Plymouth, Pennsylvania said Bass was "the greatest freak of nature I ever saw." Dr. A.H. Solial of Paris also examined Bass and said he was "by far, the most extraordinary" case he had ever seen in America or Europe. The textbook Anomalies and Curiosities of Medicine said Bass was "quite intelligent and cheerful in spite of his complete ankylosis." Finally unable to work and support himself, Bass went to live with his mother, Fannie, in Cambria in 1853. Fannie Richardson Bass was a "good woman, noted for her amiability" and "tenderness." Bass was receiving and taking so much prescription medication from doctors in these years that the druggists who sent the parcels from New York City assumed he was an apothecary retailer and they labeled the boxes "J.R. Bass, Druggist, Lockport, NY." During the winter of 1856-57, the ossification completed its sluggish journey through Bass's body and he was unable to move, except for a few facial muscles. His jaws were nearly locked and a few teeth were extracted so he could be fed. Bass could still use his other facial muscles. He could speak and be understood. He loved lots of "fresh air," was rarely ill, had a strong appetite and his digestive process was said to function as any healthy man's. That spring a Lockport carpenter named Phillip Murphy gave Bass a special bed that was comfortable and could be transported. He made use of the bed for the rest of his life. Cataracts caused total blindness to Bass in 1869 but relatives, friends and attendants attempted to satisfy his need for literature and newspapers by reading to him regularly. In a further development that baffled doctors, Bass's fingers and toes became "de-ossified," meaning that the bones gradually disappeared inside, but his finger nails continued to grow, spiraling to several inches. 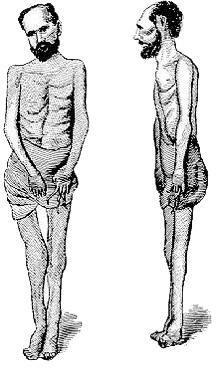 As his muscles withered, he weighed between 100 and 65 pounds. Fannie Richardson Bass cared for her paralyzed son for nearly nineteen years. She died in 1872, leaving the farm to Bass. The ossified man continually received requests from the medical community, from scientists, and lucrative promises from showmen to go on tour to display himself to an interested public. But Bass declined all such offers. Bass sold the farm and lived for fifteen years with his brother, Foster, Foster's wife Eliza Hoover Bass and their three children. Foster was a quiet fanner who kept extensive diaries of his labors, the weather, and financial dealings. He seldom wrote of his relations with his wife or the difficult time he must have had with an increasingly needy Jonathan in the house. 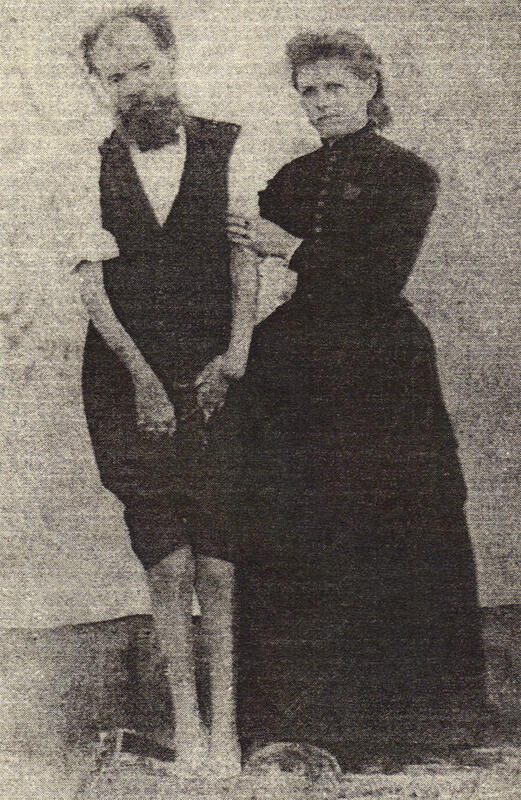 Foster appointed daughter Rose Bass, "a gentle, self-effacing girl" to labor only "in the scared work of mitigating the distress of her unfortunate uncle's condition," according to the autobiographical booklet. Foster died in 1887 and Bass, "being in need of money," decided to accept some of the invitations to go on exhibition. With assistance, he toured the country on his bed. A newspaper report from that year said, "by placing one hand under Bass's head (an attendant) raises him directly to his feet as one would stand a stick of wood on end." 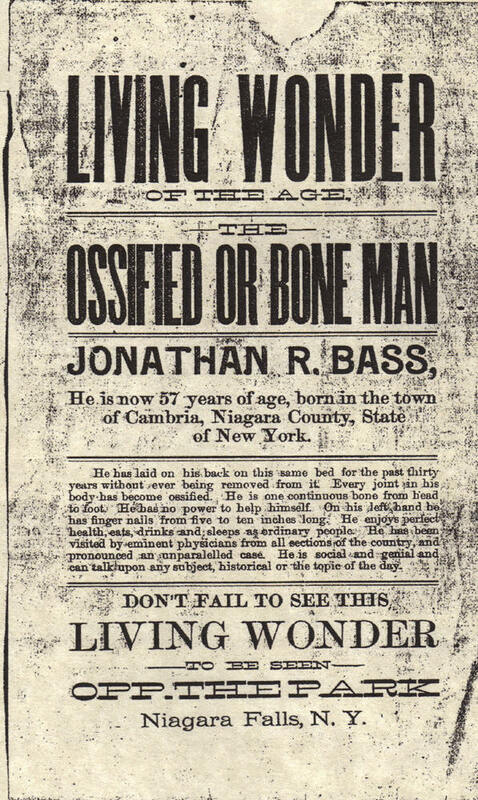 His first exhibitions as a "Living Wonder of the Age, the Ossified or Bone Man," were at a building on Canal Street in Niagara Falls. Managed at various times by his brothers and by show man Fred Latta and W.L. Fellows, Bass toured the United States and made headlines in many cities. The Scranton, Pennsylvania Times said in August 1888 that Bass "has been surprisingly successful ... and has made many friends and business relations." Clarence O. Lewis, the late Niagara County Historian, recalled in a 1965 column that, when he was a child, he saw Bass exhibited in Lockport when the Barnum & Bailey Circus toured the area. Biographies of Barnum, who hired thousands of "freaks" and curiosities, do not mention Bass, but his notoriety became so widespread that Bass was even called on to comment on news, political and social events of the period. A reporter asked Bass what he thought of President Cleveland. Bass replied that he believed Cleveland "has nearly as stiff a backbone as I have.'" Bass even had a poem prepared about the celebrated president from Buffalo. "I'm very much like Cleveland/Although that's not my name/We've both backbones with wills of our own/And we'll get there just the same." Bass toured New York City, Denver, Toronto and other cities in solo shows, side shows, and dime museums. Reports have claimed that he was paid $25 to $250 per week during tours. In the spring of 1890, Bass reportedly went on strike over a wage dispute, broke his contract with Fred Latta, and decided to replace Latta with his trusted younger brother, Seth Bass. After just five years of touring, Bass became ill in New York. He caught a cold in early September 1892 during a show at Huber's 14th Street Museum. The locale of Bass's last show became a significant footnote in show business history because it was also one of the first places that Harry Houdini performed. Sometimes called Huber's Fourteenth Street Museum, was located at 106-108 East 14th Street in Greenwich Village, New York City. Huber's often featured performing monkeys and Unthan, the "armless wonder" who played piano with his toes. Houdini performed at Huber's before enjoying widespread acclaim as an escape artist. Bass's cold developed into fever, stomach trouble and finally pneumonia. A report said that Bass, 62, knew the end was near and "he begged his brother to return him home to die." The Basses made it back to Lewiston by train on September 11 and the famous ossified man died two days later. The Bass family informed the newspapers that requests from doctors and others to ' examine the body and perform an autopsy were refused. To prevent a ^ threatened theft of the body, Bass was entombed in a burglar-proof vault at Glenwood Cemetery in Lockport. Bass's assets and properties were left to his nieces and nephews. A relative named Robert "Buck" Snell recalled that Bass's casket that was solid cement because the performer "didn't want anyone digging up his grave to examine him." Nancy Snell said that, "Interestingly, cases of ossification still exist." She has collected newspaper stories in which doctors have attributed the affliction to an injury or strain causing a blood clot that transforms a joint into a ''bone" or solid matter. Surgery has been recommended. The Associated Press offered a report of an 11-year-old girl in Portland. An energetic and intelligent youth, Robin Newton's body was mysteriously half paralyzed by ossification. Professor Kent Vincent of Oregon Health Sciences University said there are about 200 cases and the disease is not fatal. Gould, George M. and Walter L. Pyle. Anomalies and Curiosities of Medicine. History of the Life of Jonathan R. Bass. (Privately Published) Lewiston, NY: JR Bass, 1889. "Jonathan Bass, Ossified Man Lived in Lockport." Clarence O. Lewis, Union-Sun & Journal, September 10, 1959. "Rare Malady Turned Man's Body to Bone." Union-Sun & Journal, July 17, 1965. "Jonathan R. Bass, The Ossified Man." The Buffalo News, August 30, 1998. "The Ossified Man Dies at His Old Lewiston Home." Niagara Falls Journal, September 17, 1892. "The Ossified Man's Will." The Daily Cataract, September 29, 1892. "Won't Steal Bass: The Remains of the Ossified Man Sealed Up in Iron Vault." The Daily Cataract, September 30, 1892. "The Ossified Man in Scranton." The Suspension Bridge Journal, Septembers, 1888. "An Ossified Man." Niagara Falls Gazette, February 2, 1887. Note: The author wishes to thank Dan Kane, David Ulrich and George Muscato for their generous support over the years. Niagara historians Melissa Dunlap, Vernette Genter, and David Dickinson, and Nancy Snell and her family provided valuable assistance to the author. The author also wishes to thank the Lockport Public Library, Niagara County Historical Society, Cambria Historical Society, Niagara Falls Public Library and Niagara Falls Historical Society.